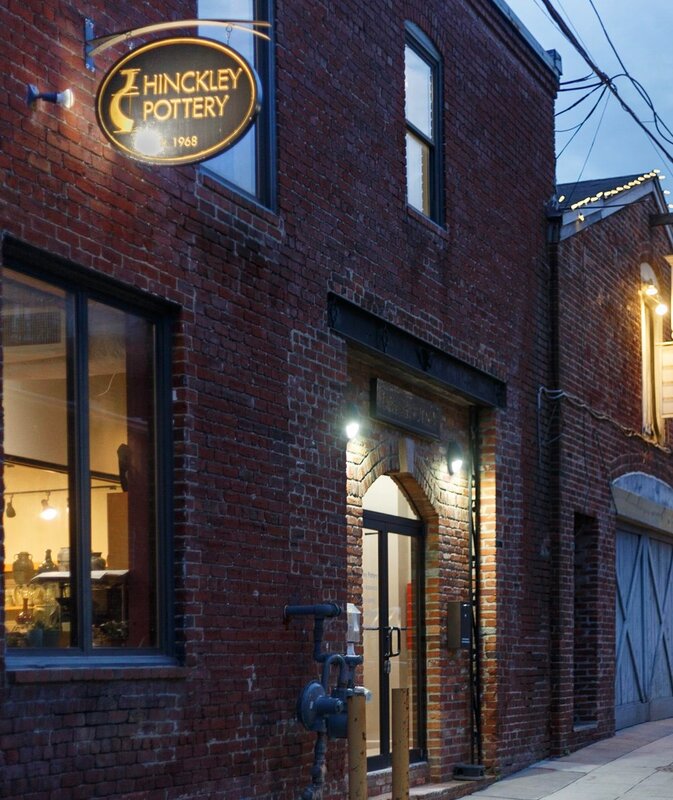 Hinckley Pottery is a privately-owned urban studio, gallery and shop housed in a former stable built sometime before 1900. It is located in the historic Georgetown neighborhood of Washington DC, next door to the venerable Blues Alley Jazz Club. 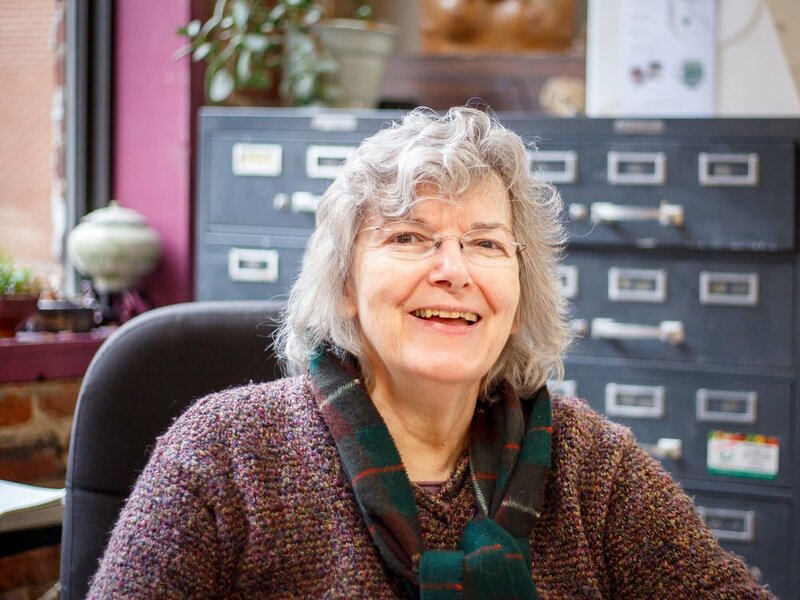 Jill Hinckley has more than 50 years of experience as a potter and teacher and is the founder of Hinckley Pottery. Her first studio was located two short blocks up Wisconsin Avenue from our Blues Alley space. 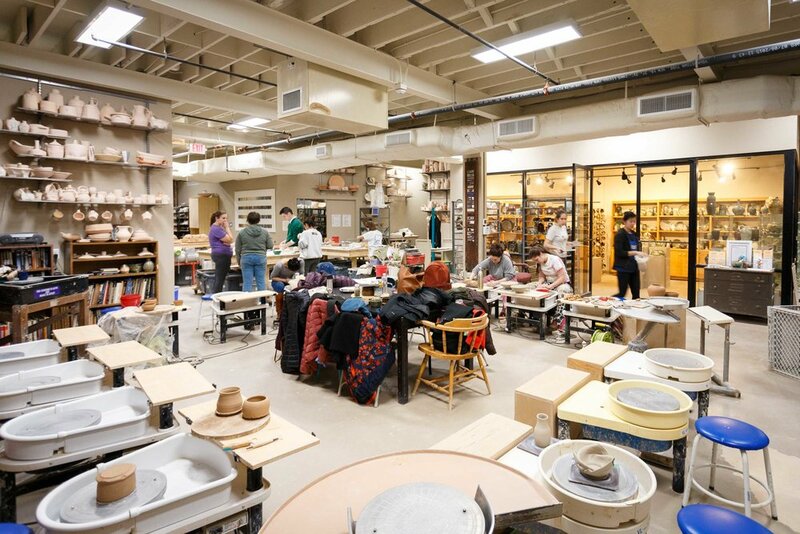 In that first studio, she developed her signature approach to teaching others how to use the potters wheel and how to approach the making of pottery. Many people and pots have transpired since then. Form was Jill’s first love in pottery and beautifully thrown forms like the classical pottery of Japan, China, and Korea still inspire her. She strives for a simple, elegant line in her work and ultimately wants her pots to be used and enjoyed. She teaches five classes each week: Tuesday am, Thursday am and afternoon, Saturday am and early afternoon. Inspired by watching a potter at a Waterford VA fair, Karen Bearman began pottery lessons with Jill Hinckley in the early 70s, and apprenticed at the studio not long after. Later she began teaching at Hinckley Pottery, at independent schools, and at two universities. Karen is a member of the Clay Guild of the Eastern Shore and Main Street Gallery in Cambridge MD. Living on the Eastern Shore provides her with a lovely commute to teach her Monday early and late evening classes. She shares her life with her avid sailor husband, an inherited toy poodle, and The Newton Brothers (three cats named Fig, Isaac, and Huey P). Karen finds special pleasure in creating pieces to enhance the daily activities of people's lives, and in facilitating students' relationship with clay. Andrew Francis’s love of pottery began as a teen watching the magic of his hometown potter as he worked. That passion was cemented in high school, developed at the local craft center and honed through college and in his travels to Japan and the UK. Along the way, he absorbed techniques from well known potters like Malcolm Wright, Bee Duxbury and Paula Shaman. Andrew worked with teens and adults at various schools in Massachusetts before moving to DC where he discovered Jill’s infamous Saturday morning class and got hooked on Hinckley Pottery. At the studio Andrew wears many hats -- as technician, kiln consultant, part of our glaze-making and glaze-firing crews and as an instructor. He teaches the Sunday afternoon wheel and evening handbuilding classes. In 2003 Sam Gordon signed up for her first class at Hinckley Pottery and, as she says, found her voice. A few years later she started learning to teach so she could help other people find their voice in clay. Along the way, Sam became our studio manager, ultimately shepherding us through a very difficult move from Adams Morgan (home for 25 years) to our new Georgetown space. She is no longer studio manager (traumatized by the move), but teaches the two Tuesday evening classes, both Wednesday classes (daytime and evening) and is part of the glaze-firing crew. Sam also leads occasional highly focused pottery intensives aimed at helping people develop particular skills. Michael Pappas has spent his life exploring ways to express himself creatively, from drawing and painting to lost wax casting, to airbrush and carving in stone and wood. He even carved a 20-foot high totem pole using a chainsaw. In 2001, he was searching for raku classes and discovered Hinckley Pottery. Visiting the studio, he knew he was hooked, After a few years developing his skills and following an apprenticeship with Jill, Mike began teaching and now teaches the Friday evening and Sunday morning classes. For many years, Mike ran a small organic farm in Lanham, Maryland, and taught private ceramics lessons on the farm. Now, he works for a nonprofit in Washington, DC, that fights hunger and food insecurity with education. He teaches ceramics in three other studios in the DC area. Ann Riley signed up for her first class at Hinckley Pottery in 1997 and has been hooked ever since. After studying with Jill for more than 10 years, she started teaching and found she loves it as much as throwing. Ann taught the kids class for many years and in 2008 ran our pottery camp for kids 9-14 years old. She now teaches the Saturday late afternoon class. Always eager to explore new ideas in pottery, Ann has taken many workshops with famous potters such as Mark Shapiro and Randy Johnston. She is fascinated with the balance of form and function. When she’s not teaching, you can find her throwing porcelain upstairs. Outside the studio, Ann works as a political strategist for environmental and other nonprofits in the Washington area. Karna Robinson met pottery in an undergrad art requirement. The class was unlike any of the rigorous science courses she was taking. And she loved it. Fast forward to 2003, a different city, a job in research and a Hinckley Pottery birthday gift certificate. Karna fell in love all over again. Quiet by nature, Karna enjoyed the whirlwind of Jill’s Saturday classes. She liked Jill's straight forward teaching style (and opinions!). Perfecting her skills, Karna assisted with Try It students and kids classes, and eventually assumed responsibility for our kids classes. Balancing work and the things she loves — pottery, playing competitive women's flag football, coaching high school girls flag football and catering — can be a challenge. But you’re sure to find Karna at the studio on most Saturdays honing her skills and on Sundays teaching two kids classes. One day in 2000 after walking past a neighborhood pottery studio several times, Sharlene Samuel finally walked in. As she remembers it, the first day she sat at the potter’s wheel and touched the clay, she felt a passion rise in her that continues to today. Over the years as her interest grew, Sharlene became part of our workstudy program, learning what is involved in running a studio. That led her to managing our glaze-making for several years. The knowledge she gained prepared her for creating her own home studio in northwest DC from which she also works. Sharlene loves every aspect of the pottery process from understanding the importance of a well made pot to creating a vessel that asserts its own beauty and character. She teaches at the studio every Thursday evening when she gets to share her passion for the clay with her students. Susan Weber first discovered Hinckley Pottery through her daughters when they were in elementary school. That was in the early days of the studio when it was still on Wisconsin Avenue in Georgetown. Getting involved with the studio herself happened much later. Hinckley Pottery then occupied the first floor and basement of a lovely old house in Foggy Bottom, didn’t have a telephone answering system and recruited new students by word of mouth. Jill taught all the classes. Things have changed since then. Susan introduced computerized record keeping, telephone answering systems and advertising. A couple of moves later two electric kilns and a gas kiln were added. Today there are more teachers, more wheels, many more students and a beautiful new studio in a very old part of Washington DC. It takes a lot to keep the studio running smoothly, and we greatly appreciate and depend on a wonderful crew of helpers who see that everything stays on track. They prepare the clay, mix glazes, stack and unstack kilns, and generally keep things humming. A special thanks to glaze gurus David Knight and Andrew Francis; to our stalwart gas kiln firing team of David, Andrew, Samantha Gordon and Diane Hobbs; to our photography and website specialist Jack Waterman; to our workstudy program manager Sarah Waybright and to the many other moving parts of our workstudy team. We thank you all! The first floor studio, shown here, is furnished with 15 electric wheels, two kick/electric combination wheels, and one treadle wheel. The second floor has 10 electric wheels and tables for hand-building, as well as resident spaces. The showroom is in the background. Part of the bisque library can be seen on the left. This is the stoneware wedging area. (Porcelain is wedged in a separate area.) Above it are glaze sample tiles in our four clay bodies: Standard English porcelain, Highwater phoenix, Highwater orangestone and Laguna dark brown. Pugged studio clay is a combination of phoenix and orangestone. 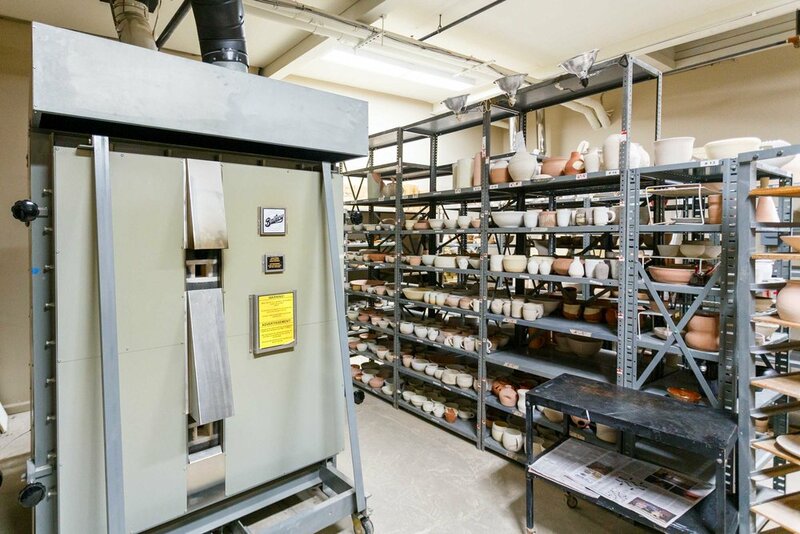 The kiln room houses three electric kilns — on the other side of the shelving above. These are used for bisque firing. Glaze firings happen in the Bailey shuttle gas kiln. The electric kilns are always either firing or cooling. The gas kiln is usually fired once a week, more often if there are enough pots. Two 4x8 foot glaze tables provide ample space for glazing and for stashing glaze tubs and buckets underneath. Some glazes are perennial favorites (in big tubs) and always available. Others are in 5 gallon buckets. These are augmented periodically as our glaze-making crew explores new possibilities.